I noticed this view in early February, which shows three stone buildings on Elgin Street: the former Normal School (Teacher's College) that is now the Heritage Building wing of City Hall, Knox Church at Lisgar, and the stone house (now rental apartments) behind the stores on Elgin at Cooper, the name of which escapes me. The Fairmont Château Laurier is also in the background of the photo. The group Our Ottawa organized a rally today to oppose expansion of the urban boundary. More details in this Citizen article. A number of councillors were at last year's rally, and many of them spoke. Councillors Cullen and Jellett were both in the crowd at the rally today. 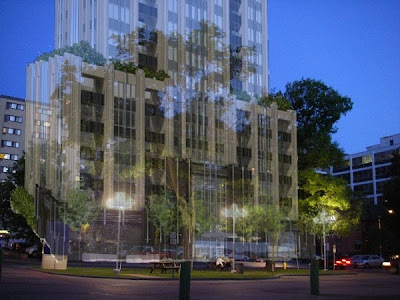 Tomorrow, Tuesday 23 February 2010, the City of Ottawa's Planning & Environment Committee (agenda) will be considering an application to alter the zoning at Laurier, Bank and Slater, to accommodate the third phase of the Standard-Life buildings in addition to the ones at 280 Slater Street and 333 Laurier. 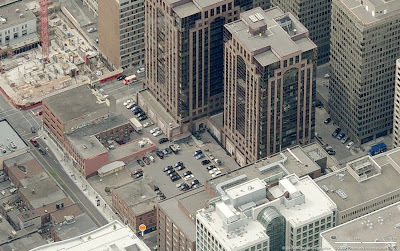 Here's an overhead shot from Bing Live Maps. The tall red-ish building at the top is 333 Laurier, and its fraternal twin to the North (below it in the photo) is 280 Slater. 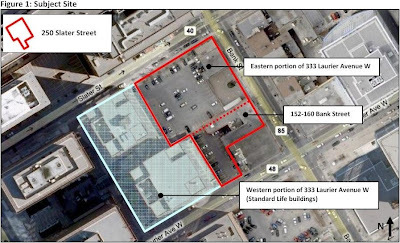 The parking lot between it and the buildings along Bank are to be part of the proposed new 18-storey building, and the facades of the heritage buildings are to be incorporated into the new development. More on that later. The block at the corner of Bank and Laurier, once a furniture store and now owned (or at least occupied) by a forestry workers union, is not part of the development. Here's an aerial shot from 1926 that includes the site. 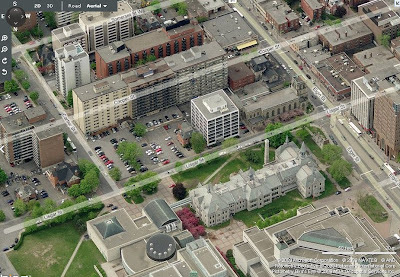 At the centre of the shot is the Jackson building, and the block south of it (to the lower-right) is the subject block. It's certainly changed a lot since 1926. Long before it was reported in the Citizen, I got a phone call on Wednesday night alerting me to a fire at the Beaver Barracks housing development under construction. I was just getting off the canal around Fifth Avenue, and managed to take a photo of some white puffs of smoke coming from the site. Major fires usually have large columns of black smoke. By the time I got to the site, the fire was already extinguished, and firefighters were in the lengthy process of making sure the fire hadn't spread anywhere else. While we've had a lot of fires lately, it was pretty clear that this one didn't do a whole lot of damage to the building. The word I've heard is that the fire was mainly on one of the scaffolding platforms, so the flames would have looked more severe to onlookers than if the fire were within the building. 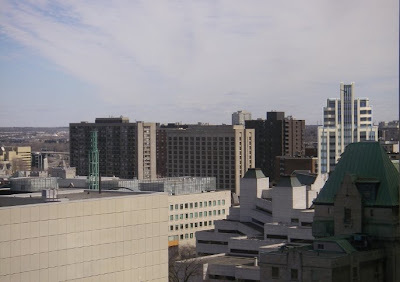 Charlesfort Developments is going to the Committee of Adjustment on February 17th, 2010, to seek 'minor variances' for a 20-storey residential tower across from City Hall. Doug Casey, President of Charlesfort, wants to speak to the CCCA at tonight's meeting of the CCCA's Planning & Development Review Committee (5:30pm at Second Cup on Elgin and Lisgar). There will also be a broader community consultation tomorrow (Tuesday, February 9, 2010) at 5:30 p.m. in the Billings Room at City Hall. 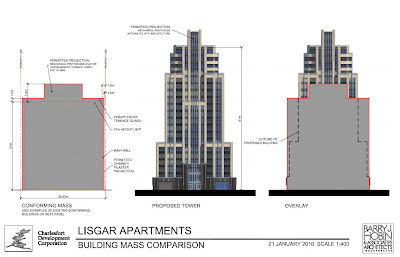 As shown in the diagram below, the proposed building is nearly 2/3 heigher than the maximum allowed 37.0 metres. Casey says that the total floorspace approximates that of a big box that fills the entire permitted building envelope, citing the many such boxes in the neighbourhood. But that's just the theoretical box if you build to the maximum dimensions--one is not obliged to build to the maximum, and one is not entitled to exceed one limit merely for staying within another. 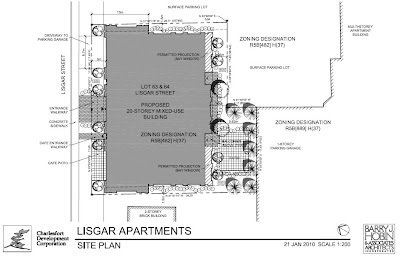 As for the site, it's the parking lots at the corner of Lisgar and Cartier, directly across from City Hall and the Heritage Building of City Hall. There's a two-storey red brick house (now serving as offices) next door. 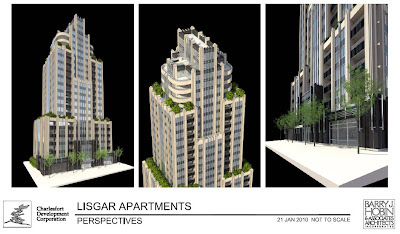 The submission also says that the stepped nature of the building helps to break up its massing. This it does, to an extent, but it does so by reducing the minimum east and west side lot setbacks from 1.5m to zero for the first 13 metres of the site, and by reducing the rear (southerly) setback to 3.5 metres. The red brick house next door will be dwarfed. 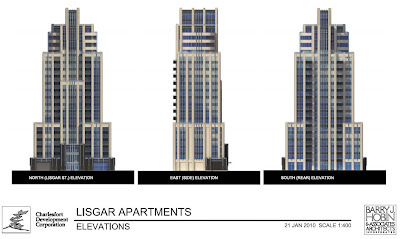 I set up some diagrams of my own, based on how the surrounding context would look with this building nearby. The scale is approximate. As for the height, I tried to approximate how it would fit into this scene taken from Albert Street. I think the building would actually be a bit taller than how I set it up here, but even so it's clearly taller than anything else in the Golden Triangle. February 17th: Make a presentation at the Committee of Adjustment's Public Hearings at Ben Franklin Place Client Service Centre, 101 Centrepoint Drive. There has been some restoration of the exterior of the Blackburn apartments on Somerset West near Metcalfe. The other day, I was going by and noticed a curious feature of the black lettering. Not the reflection of the noon-hour sun, but the inverted second "B" in the name. Has it always been like that?